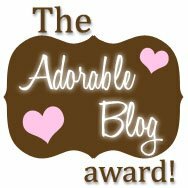 Steph over at Electric LadyBand gave me the Adorable Blog award a while back….I am such a slacker :(. Thanks Steph for liking me even among my slacker-ness! 1. I got married in a JP’s office after 6.5 months of knowing each other and only actually “seeing” each other 3.5 of those months. We were given 6 months, we’ll hit 12 years next month. 2. Olive Garden and a few hours in AF billeting was our honeymoon thanks to good ‘ole Uncle Sam. 3. I have lived in 11 cities (some multiple times) and have moved houses more times than I have fingers and toes combined. 4. I love roller coasters and have been to theme parks in 5 states and 3 countries. 5. Sky diving is on my bucket list, so is the Sky Jump off the Stratosphere. Bungee jumping and para-sailing just weren’t enough adventure. 6. I am seriously addicted to ice cream. 7. Clutter wreaks havoc on my moods. Some people thrive with clutter, I shut down. 8. I am a huge Apple FanGirl. I will NEVER again have a Windows based PC. 9. I can go the whole day and never say a word to anyone and it does not bother be in the least bit. Jacey on the other hand, can’t go 2 minutes and Bryan can go either way. It makes for very interesting dynamic in our household. 10. I am considering going back to college and am absolutely petrified. I still have no clue what I want to do when I grow up either. I’ve (gasp) never used an Apple, but I’ve heard many people say they love them. What are the biggest perks?